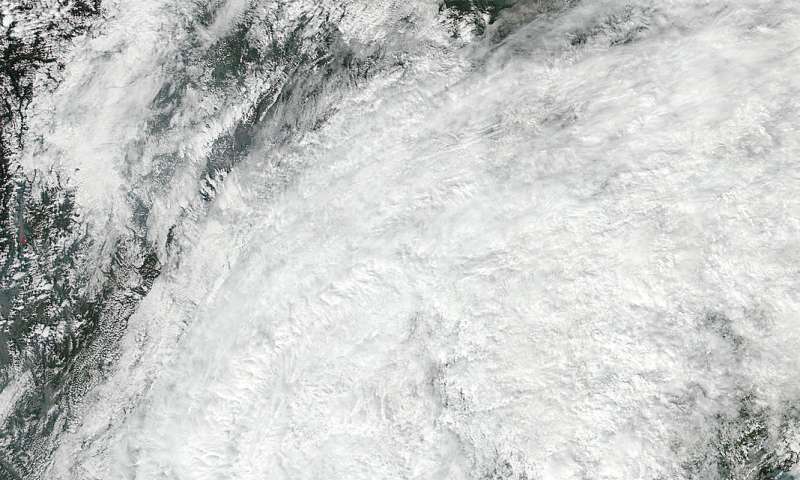 Tropical Depression Sarika made landfall early on Oct. 19 as NASA-NOAA's Suomi NPP satellite passed overhead and provided an image of the storm. On Oct. 19 at 1:35 a.m. EDT (05:35 UTC) the Visible Infrared Imaging Radiometer Suite (VIIRS) instrument aboard the NASA-NOAA Suomi NPP satellite captured Tropical Depression Sarika making landfall in southern part of the Guangxi province of mainland China, near the border of Vietnam. At 5 a.m. EDT (0900 UTC) on Oct. 19 the Joint Typhoon Warning Center (JTWC) issued their final bulletin on Sarika. At that time, Sarika's maximum sustained winds were near 34.5 mph (30 knots /55.5 kph). It was moving to the north-northwest at 8 mph (7 knots/13 kph). At that time, the center of the depression was about 130 nautical miles east-northeast of Hanoi, Vietnam near 21.7 degrees north latitude and 108.1 degrees east longitude. Sarika is expected to dissipate over land, however, there is a slight chance its remnants may reemerge over the Gulf of Tonkin.